The hyperscalers of the world have an insatiable appetite for compute power, but the latest IDC server numbers suggest enterprises are spending big bucks again, too. According to IDC’s Worldwide Quarterly Server Tracker, vendor revenue in the worldwide server market increased by nearly 48 per cent year-over-year to $22.5 billion during the second quarter of 2018, making it the fourth consecutive quarter of double digit revenue growth and its highest total revenue ever. In Canada, server revenue went up by nearly 20 per cent. 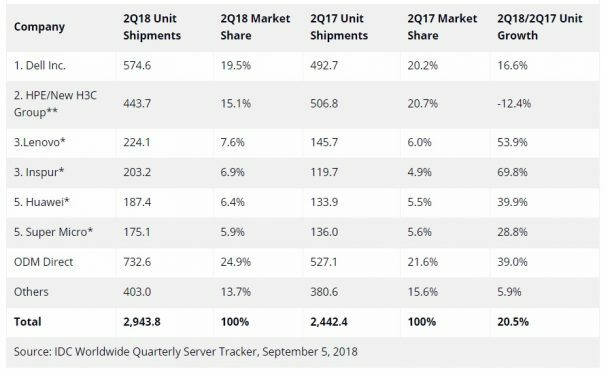 Worldwide server shipments also spiked 20.5 per cent year-over-year to 2.9 million units in the same quarter. This growth can partially be attributed to hyperscalers’ ongoing expansion of their data centres, says Sanjay Medvitz, senior research analyst of servers and storage at IDC. But it’s not just hyperscalers that are spending money. “Enterprises continue to invest in new infrastructure to support next-generation applications and achieve cloud-like benefits on-premises,” says Medvitz. Zachary Dickson, Hewlett Packard Enterprise’s Canadian channel chief agrees. “When we see this kind of surge in industry standard server sales and x86 sales, I’d say we’re seeing a flush of customers who have made decisions on where they are going to place their bets when it comes to either public, private, or where the vast majority of customers are going, hybrid cloud,” told CDN. The 20 per cent figure for Canada is significant, and while it’s only half of the global market increase, it’s very impressive to see those numbers in Canada, says Kevin Connolly, president of Dell EMC Canadian commercial sales. “Everyone was talking about how the server was dead three years ago. It was going away with VMware and virtualization. But the absolute opposite is occurring,” says Connolly, adding the need for more compute power, especially as the data centre inches closer to the edge, have increased significantly. The sluggish forecast that loomed over the server market between 2015 and 2017, as enterprises and other businesses pulled their spending back, was due to customers reassessing the market and figuring out the most efficient way to run their data centres as cloud and hybrid cloud technology started to gain serious momentum, explains Dickson. But now that some of those major decisions are made, customers are turning to their trusted channel partners not just to supply the hardware, but to provide them with valuable insight. HPE’s focus for the past 18 months has been to make it easier for the channel to sell on their behalf, says Dickson, and starting Nov. 5, HPE is revamping its pricing process through a new quoting system called Medallion. “For years, we put partners through a rigorous process that required a lot of time and information provided through HPE to produce a price for them to quote. With Medallion, we’re putting the power in the channel’s hands to deliver a quote, close the deal co-selling with HPE, and move on to the next customer,” explains Dickson. From Dell EMC’s perspective, Connolly says synergy has finally developed across the partner ecosystem in Canada following the mega-merger between Dell and EMC. Partners have wrapped their heads around the full breadth of the Dell EMC brand, which now includes VMware, Pivotal and SecureWorks. In August, Dell EMC announced an Enterprise Preferred Program that gave partners preferred access to 2,000 enterprise accounts, and during a recent quarterly Partner Broadcast web briefing, Joyce Mullen, Dell EMC channel chief, announced that the program is extending to 20,000 commercial accounts. Mullen also announced new coskilled badges for Dell EMC and VMware, bringing together Dell EMC Proven Professional and VMware Certified Professional certifications. These badges are for individual administration and design capabilities across converged and hybrid cloud, but in the future, Mullen says they will be launched across the entire portfolio. As HPE and Dell EMC continue to jostle for that number one position in servers and storage, Dickson praises the level of competition in the market and the fight for the “movable middle” as he calls it, that encompasses thousands of mid-market accounts.